SUMMARY: This brief case report describes an unusual presumed association of chronic HIV infection with multiple cerebral arteriovenous malformations. An adult male patient presented with recurrent spontaneous brain intracranial hemorrhages and neurologic deficits requiring surgical evacuation. The diagnosis was delayed because of lack of a high index of suspicion of this unexpected and previously unrecognized association. HIV-infected patients are at a higher risk for stroke, both ischemic and hemorrhagic. However, symptomatic multiple cerebral arteriovenous malformations are not a reported presentation of HIV. We herein report the clinical and imaging findings in an adult with HIV and multiple arteriovenous shunts affecting both cerebral hemispheres with 3 documented episodes of brain hemorrhage. The institutional ethical clearance committee granted approval for publishing this case report. A 45-year-old Thai man known to have HIV infection, diabetes, and hypertension presented with a sudden onset of motor weakness. Neurologic examination revealed right hemiparesis and hyperreflexia. An urgent head CT scan showed an acute hematoma in the left frontoparietal region with subarachnoid and intraventricular bleeds. The left cerebral hemisphere appeared diffusely edematous with some subfalcine herniation. Postcontrast images showed multiple scattered enhancing foci bilaterally within the cerebral hemispheres. The differential diagnoses entertained in light of the patient's history included spontaneous bleed, opportunistic infection, and metastatic lesions. Laboratory results showed mild anemia (hemoglobin, 10.4–13.7 g/L) and thrombocytopenia (platelet count, 65,000–123,000/μL). Otherwise, results of liver function tests, renal function tests, coagulation tests, and lipid profiles were within normal ranges. The hematoma was urgently evacuated. Medical history was significant for HIV infection contracted at age 33 years. After contracting Pneumocystis carinii infection at age 38 years, the patient was initiated on a triple antiretroviral regimen and remained without any AIDS-defining findings, with CD4+ T cell counts of 300 to 500 cells/μL. The patient also had a 10-year history of noninsulin-dependent diabetes (on glibenclamide), essential hypertension, and smoking (10-pack-year). Follow-up enhanced CT and MR imaging scans at 1 month demonstrated resolution of the parenchymal hematoma and some postoperative changes. Several parenchymal hypodensities were also noted in both hemispheres, suggestive of previous insults, possibly of the same etiology. In addition, there were some small adjacent enhancing foci around these lesions, best seen after contrast administration. Brain MR imaging study confirmed the presence of small flow voids within the white matter of both cerebral hemispheres and the left thalamus (Fig 1A). Gradient-echo sequence revealed hypointense signal intensity adjacent to these lesions, presumably because of previous bleeds and hemosiderin deposits. 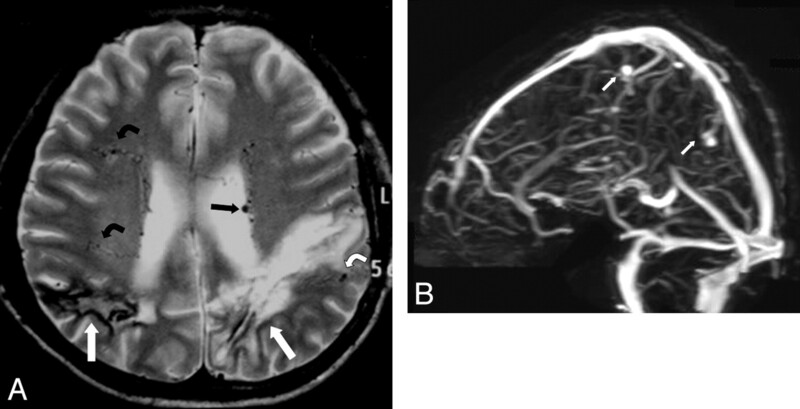 Brain MR venography showed small venous pouches associated with dilated cortical veins (Fig 1B). A, Axial T2-weighted MR imaging of the brain. Evidence of previous parenchymal bleeding of different ages is seen in both cerebral hemispheres (white arrows). Multiple flow voids are seen within the white matter (black bent arrows), subependymal area (black arrow), and gray-white matter junction (white bent arrow). B, MR venography shows small venous aneurysms draining into slightly dilated cortical veins (white arrows). The patient had 2 additional episodes of right hemispheric bleeds at 8 and 19 months after discharge and eventually he agreed to undergo a cerebral angiography. Under conscious sedation, 5-vessel cerebral angiography (bilateral internal carotid artery, bilateral external carotid artery and left vertebra artery) was uneventfully performed. The study showed multiple small arteriovenous shunts within the temporal, parietal, and frontal lobes (Fig 2A, -B), representing deeply seated pial microarteriovenous malformations (AVMs) within the brain parenchyma. There were multiple feeding arteries from the anterior and middle cerebral arteries. There was a complex pattern of draining veins associated with multiple focal aneurysms. The vertebrobasilar and the external carotid circulations were normal. Cerebral angiography of the internal cerebral arteries. Arterial phase of the right (A, lateral projection) and left (B, frontal projection) depicting the presence of multiple pial arteriovenous nidi with associated venous aneurysms (transparent arrows) and early opacification of the draining veins (arrowheads) and dural sinuses (black arrows). C, 3D rotational angiography, arterial phase, of the right internal cerebral artery. Note the early opacification of the venous aneurysm (bent arrows) and draining veins (straight arrow). The patient is currently scheduled to undergo staged embolization of the AVMs, primarily targeting the larger venous aneurysms to reduce the risk for additional hemorrhage. We only found 1 case report by Wolf et al12 describing a 53-year-old patient with HIV infection who had a right Rolandic cerebral AVM leading to recurring focal seizures. There was a single draining vein with a large varix and a flow-related arterial aneurysm. After 2 years of highly active antiretroviral therapy, the AVM was completely and spontaneously occluded. The authors hypothesized that the suppression of the angiogenic activity of HIV led to resolution of the shunt. The case presented in our report is unusual for many reasons. First, the presence of multiple cerebral AVMs is rare. Second, the occurrence of multiple episodes of cerebral hemorrhage secondary to multiple micro-AVMs has never been reported before in HIV. Third, most of the cerebrovascular complications in the literature were reported in patients with advanced immunosuppression. Our patient maintained a moderate immunosuppression status while receiving triple antiretroviral therapy without signs of AIDS. In contrast to the multiple cerebral AVMs seen with hereditary hemorrhagic telangiectasia, which are superficially located within the cerebral cortex and are not associated with hemorrhage or venous pouches, the lesions encountered in out patient were deeply situated lesions within the cerebral parenchyma and developed multiple hemorrhages. In conclusion, this unusual case highlights a rare, previously unreported complication presumably related to a long-standing HIV infection. Cerebral AVM, though rare, might be considered in the differential diagnosis of acute cerebral hemorrhage in patients with HIV within the proper context and prompt a proper diagnostic and therapeutic approach. Early diagnosis of this rare manifestation of HIV could potentially prevent a disabling and potentially lethal course. Accepted after revision November 25, 2008.